Key Perspectives: dharma or religion; religion and serving humanity; social responsibility of religion. One of the approaches or attitudes to religion which is very popular among the secular intelligentsia and also with many religious reformers is to make religion into a tool for development and change of the society. The argument of the religious reformer is that religion should come out of its spiritual ivory tower of prayers and meditation and help to solve the problems of human society like poverty and exploitation. It should be a friend and saviour of the poor and the oppressed and the downtrodden and help in elevating their social condition. The argument has a great appeal to the moral and philanthropic sentiment of people, especially to youthful idealism. But we have to look at this argument in a deeper light than that of secular and moral sentimentalism. The well known Indian concept of swadharma may perhaps help us to understand better the deficiency of the argument of the religious reformer of the society. According to this Indian concept each human activity has its own unique intrinsic inner law of its nature, dharma or swadharma, and the aim, function, capacities and responsibilities which arises logically from its dharma. Any human activity, to progress smoothly to its highest potential and contribute effectively to the society must stick to its dharma or swadharma. Now the question is whether social reformation is part of the dharma of religion? The essential dharma of religion is “saving the soul” which means spiritual development of the individual. Economic or social upliftment of the masses is not the dharma of religion. The social reformer’s insistence on the social responsibility of religion is quite legitimate. Religion as a social institution and as a part of human society, has a social responsibility. But this social responsibility of religion has to be in harmony with the dharma of religion. It cannot be economic or social reformation for which religion has neither the temperament nor the capacity. The social responsibility of religion can only be to help in the religious and spiritual reformation and development of the community. For example the dharma of business as a social organ is to create wealth for the society. The social responsibility of business is to help in the economic development of the community by sharing some of its wealth and also the capacity for creating wealth with the economically or socially disadvantaged section of the community. We don’t ask or demand business to help in the spiritual development of the community because that is not its dharma. Business has neither the capacity not the temperament for spiritual development of the community. In the same way, we cannot ask or demand religion to help in the economic or social upliftment of the community. The social responsibility of religion is to share its spiritual resources with those who are in need of spiritual help. This doesn’t mean religion should keep away from society in an ascetic or elite aloofness. Social work or service can be part of the spiritual discipline of religion, done as a means for inner development. But when it becomes a part of the spiritual discipline it should be done with a spiritual attitude which is very different from the moral attitude. The moral or the reformist attitude to service is based on the idea of “helping” or “saving” the world or to “uplift” the poor and the downtrodden and the oppressed. There is behind this reformist idea of service an open or hidden assumption that we know what is good for others. But in a spiritual discipline service is not a means of helping others but helping ourselves! It is one of the most effective means for eliminating the ego especially in the active and dynamic parts of our being and thereby accelerating our spiritual growth. So when religion or the seeker of the spirit takes up works of social upliftment, it has to be done with a very different attitude from that of a moral or social reformer. The reformist attitude to service quite often engenders a subtle moral pride of the do-gooder which is a great obstacle to spiritual development. Even when somehow it escapes from or avoids this moral pride it may get trapped in some sort of a moral satisfaction and contentment which will extinguish the spiritual aspiration. Ethical and moral growth and the fulfillment it brings are an important part and stage in the religious and spiritual development of the individual. But the spiritual seeker should never forget that ethics or morality is only a stage and a means and not the end. The highest aim of religion transcends morality and raises towards a supramoral divine goodness which the human ethics is not capable of. So the religious seeker should not rest content with any form of moral fulfillment. The seeker of God when he undertakes works of service, has to do it as an offering to the Divine, without seeking personal benefit from it in the form of recognition, appreciation, fame or gratitude; with a vigilant inner gaze on himself to detect and reject all forms of ego; and with an unflagging spiritual aspiration in the heart which is not satisfied with any intermediary heavens of mental, moral, aesthetic or psychological fulfillment and constantly presses towards the highest spiritual realization, that is union with the Divine Source of our being. In the beginning, the seeker who walks in the path of God does acts of service with a spiritual selfishness, for his own inner development. But as he grows inwardly he begins to feel more and more a sense of inner oneness with those whom he serves, feeling them as part of his own self. When he has this experience of oneness, it eliminates all forms of ego from his consciousness and the initial spiritual selfishness is transformed into a spiritual selflessness. This spiritual selflessness is something deeper and more creative than the moral selflessness because there is no ego in it. This loss of ego and a sense of oneness or identity with those whom you serve brings a deeper love and compassion into our acts of service and also a greater receptivity to the universal forces. But the religion of the future has to do something more than helping the spiritual development of the individual. It has to become a guiding light for the spiritual development of the community as a whole. Here comes the grain of truth in the social reformer’s demand on religion to serve society. But as we have already discussed, this “social responsibility” of religion cannot be the economic and social upliftment of the community through the traditional methods. Religion has to discover the inner spiritual causes of social problems like poverty and find a lasting spiritual solution to these problems. It has to discover the deeper spiritual significance and purpose of each activity or organ of the collective life of man, like for example economics, politics or commerce and find the path for manifesting the spiritual dimension in the collectivity and its higher potentialities in the outer life of man. This is perhaps the future mission of religion. 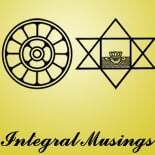 This entry was posted on June 16, 2012 by integralmusings in Religion, Spirituality & Philosophy.